When type ‘windows 7 cannot install on GPT partition style’ in Google, there are about 86,200 results searched out within 0.17 seconds. Many people are confused that why windows 7 cannot be installed on GPT partition style. Now, we have to make some definitions clear and tell everyone how to deal with that. Second, your computer may not support UEFI. We need to know that there are two partition styles: GPT and MBR. If we want to install windows on GPT disk and boot from it, the motherboards in computer should support UEFI, otherwise you should use MBR to boot from. When you encounter the situations mentioned above, you can get few options which may help you to solve your trouble. Reboot the PC in legacy BIOS-compatibility mode. 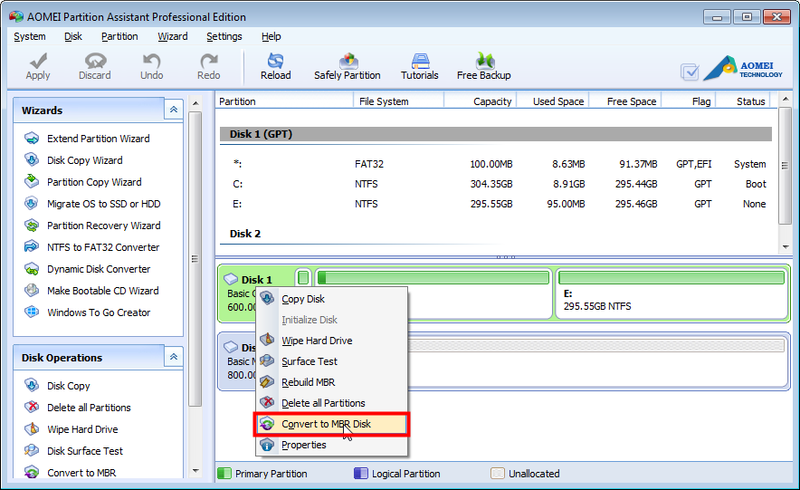 This option lets you keep the existing partition style. You can do this by yourself reformatting the drive using the instructions below, or if you need to preserve the data, use a third-party utility to convert the drive to GPT format. As for the second situation, we have to convert GPT to MBR. Only in this way will it help you. Of course, you use disk management in windows explorer to covert, but it is very complex and even make you drive. So, it is a good choice to make it with a third party software. If you use disk management to convert one disk from GPT to MBR, it will require you to clean all data and files in the disk. That’s very annoying for everyone. With software developing, so many kinds of software can convert disk between two formats without data loss. In the interface of AOMEI Partition Assistant, you select the disk you want to convert, and right click and select “Convert to MBR Disk”. For more information about ‘window cannot install on GPT partition’, you can click this. After you converting disk from GPT to MBR, you would be easy to install windows 7 on your computer. How to Make a Recovery Partition to Protect Windows System?